Herbs for labor induction and many other health-related issues can be safe if you use caution and work with a professional in the field of herb knowledge. Yes, certain herbs can help with inducing labor, which is why it's so important to be careful of what you eat, drink, and put on your skin during pregnancy. Herbs are like other medications in the respect that they are not all safe all the time and they don't all work the same for everyone. Usually less evasive than other induction methods such as a Pitocin IV. Allows you to stay more in charge of your labor. This point is true especially of women who administer their own herbal medicines. It can feel great to depend on your own herbal knowledge. Some can leave your system more quickly than certain modern medicines. Less painful than some medical inductions. On a more organic level, herb use connects you with the women of the past. For generations, herbal medicines have been used as remedies, treatments, and emotional healers. Many women feel that herb use connects them spiritually or physically to our earth, which is often a much calmer and nicer space to be in than having a connection to a sterile and sometimes cold modern medical system. Herbs can be grown organically and are healthier for the planet than mass production of modern medicines in a factory and lab, which is important to sustainable-minded individuals. All of the above are some of the reasons women choose herbs over other medical options. Midwives, aromatherapists, herbalists, acupuncturists, doctors, registered nurses, holistic healers, and more are some of the professionals who might know how to use herbs safely. Some of these care providers use herbs often and some never. Many people think that only holistic healers use and know about herbs but really there are many people you can talk with about safe herb use. Notice we do not include advice on how to use these herbs for labor induction. Some of the above herbs can be deadly when used incorrectly. Do you know which ones? The best way to find out how to learn to use the above herbs to induce labor is to talk with a professional. It's not safe to use an herbal remedy without professional advice, especially during pregnancy. People can absolutely learn to use herbs and natural medicines at home, but it takes research and consultations with professionals to do this safely. At the end of this article are resources you can access to learn more. Usually people say safety first but in the case of ANY medications (herbs or others) during pregnancy and labor, safety should always be the first and last thing you consider. Safety all the time during pregnancy! The largest problem with 'natural' or holistic medicine is that people don't always take it as seriously as they do a prescription or even an over-the-counter drug. Holistic medicines like essential oils, plant essences, massage, acupuncture, and herbs can be wonderfully useful but can also be just as dangerous and have as many side effects as consumer medications. Always research herbs before use. Research includes your own reading, talking with a professional in the field of herb knowledge, and talking with your pregnancy care provider. If you don't have herb experience, never try to medicate yourself. 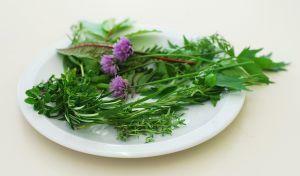 Just like you would never self-dose with a prescription, you should never self-dose with herbs. DO NOT grab recipes for herb use off the Internet. Again, talk with a professional or use a highly recommended herbal medicine book written by someone in the field. Never use herbs for induction during pregnancy until your actual due date has arrived. In fact, it's even better to wait for a week past your due date. Even though this is about inducing labor, it should be said that herbs (or any other medications) should not be taken during the first trimester of pregnancy without the explicit support of your care provider. Something very safe and smart to do is to try natural induction of labor before trying herbs or other medical induction methods. Use the least amount of induction intervention first. Wise Woman Herbal for the Childbearing Years by Susan S. Weed: A favorite and now classic book among many involved in birth and women's health. Full of helpful information and herbal recipes for healing, pregnancy, birth, and beyond. The American Herbal Association: Useful information about all sorts of herbal topics and beautiful photos. The National Association for Holistic Aromatherapy: Find a safe aromatherapist. National Directories Listings for holistic medicine: Find even more safe care providers who treat with herbs.